This refers to the original Game Boy portable console. Since the console is not region locked, this entry refers to all regions this model was sold in. The Game Boy (ゲームボーイ) is an 8-bit handheld video game device developed and manufactured by Nintendo. It was released in Japan on April 21, 1989, in North America on July 31, 1989, and in Europe on September 28, 1990. 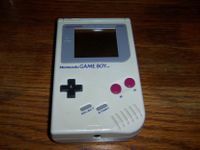 In Southern Asia, it is known as the "Tata Game Boy" It is the first handheld console in the Game Boy line, and was created by Gunpei Yokoi and Nintendo's Research and Development 1—the same staff who had designed the Game & Watch series as well as several popular games for the Nintendo Entertainment System.